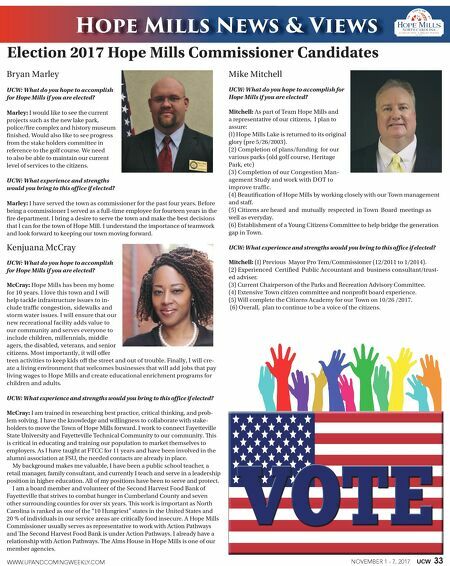 NOVEMBER 1 - 7, 2017 UCW 33 WWW.UPANDCOMINGWEEKLY.COM Hope Mills News & Views Election 2017 Hope Mills Commissioner Candidates Bryan Marley UCW: What do you hope to accomplish for Hope Mills if you are elected? Marley: I would like to see the current projects such as the new lake park, police/fire complex and history museum finished. Would also like to see progress from the stake holders committee in reference to the golf course. We need to also be able to maintain our current level of services to the citizens. UCW: What experience and strengths would you bring to this office if elected? Marley: I have served the town as commissioner for the past four years. Before being a commissioner I served as a full-time employee for fourteen years in the fire department. 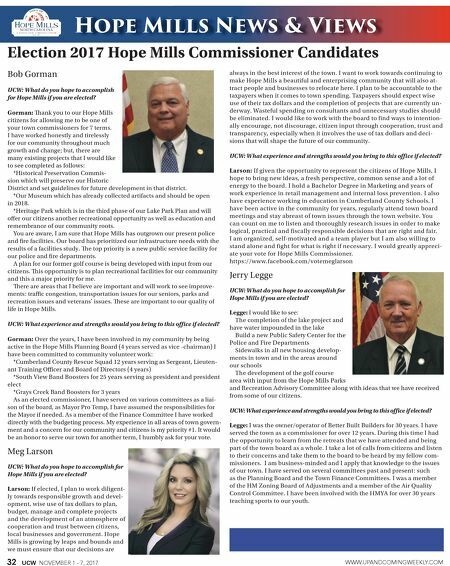 I bring a desire to serve the town and make the best decisions that I can for the town of Hope Mill. I understand the importance of teamwork and look forward to keeping our town moving forward. Kenjuana McCray UCW: What do you hope to accomplish for Hope Mills if you are elected? McCray: Hope Mills has been my home for 10 years. I love this town and I will help tackle infrastructure issues to in- clude traffic congestion, sidewalks and storm water issues. I will ensure that our new recreational facility adds value to our community and serves everyone to include children, millennials, middle agers, the disabled, veterans, and senior citizens. Most importantly, it will offer teen activities to keep kids off the street and out of trouble. Finally, I will cre- ate a living environment that welcomes businesses that will add jobs that pay living wages to Hope Mills and create educational enrichment programs for children and adults. UCW: What experience and strengths would you bring to this office if elected? McCray: I am trained in researching best practice, critical thinking, and prob- lem solving. I have the knowledge and willingness to collaborate with stake- holders to move the Town of Hope Mills forward. I work to connect Fayetteville State University and Fayetteville Technical Community to our community. is is critical in educating and training our population to market themselves to employers. As I have taught at FTCC for 11 years and have been involved in the alumni association at FSU, the needed contacts are already in place. My background makes me valuable, I have been a public school teacher, a retail manager, family consultant, and currently I teach and serve in a leadership position in higher education. All of my positions have been to serve and protect. I am a board member and volunteer of the Second Harvest Food Bank of Fayetteville that strives to combat hunger in Cumberland County and seven other surrounding counties for over six years. is work is important as North Carolina is ranked as one of the "10 Hungriest" states in the United States and 20 % of individuals in our service areas are critically food insecure. A Hope Mills Commissioner usually serves as representative to work with Action Pathways and e Second Harvest Food Bank is under Action Pathways. I already have a relationship with Action Pathways. e Alms House in Hope Mills is one of our member agencies. Mike Mitchell UCW: What do you hope to accomplish for Hope Mills if you are elected? Mitchell: As part of Team Hope Mills and a representative of our citizens, I plan to assure: (l) Hope Mills Lake is returned to its original glory (pre 5/26/2003). (2) Completion of plans/funding for our various parks (old golf course, Heritage Park, etc) (3) Completion of our Congestion Man- agement Study and work with DOT to improve traffic. (4) Beautification of Hope Mills by working closely with our Town management and staff. (5) Citizens are heard and mutually respected in Town Board meetings as well as everyday. (6) Establishment of a Young Citizens Committee to help bridge the generation gap in Town. UCW: What experience and strengths would you bring to this office if elected? Mitchell: (I) Previous Mayor Pro Tem/Commissioner (12/2011 to 1/2014). (2) Experienced Certified Public Accountant and business consultant/trust- ed adviser. (3) Current Chairperson of the Parks and Recreation Advisory Committee. (4) Extensive Town citizen committee and nonprofit board experience. (5) Will complete the Citizens Academy for our Town on 10/26 /2017. (6) Overall, plan to continue to be a voice of the citizens.